A 25-year-old Indian student was fatally shot in the back during a suspected attempted robbery at a restaurant where he worked in Kansas City in the United States state of Missouri, according to authorities. 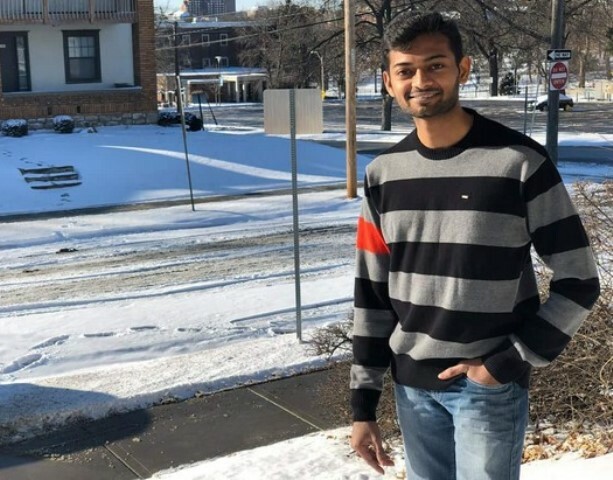 Kansas City police identified the victim as University of Missouri-Kansas City student Sharath Koppu, who was shot at on Friday evening at J's Fish and Chicken Market near 54th and Prospect, where he worked as a part-time employee. He died shortly after being taken to a hospital. Koppu from Telangana was a software engineer who came to the US in January to pursue his master's degree. 'An Indian student became victim of shooting in Kansas City, Missouri. We r in contact with his family & police. We will provide all assistance. Our officers are also on the way to Kansas City (sic),' the Consulate General of India in Chicago tweeted on Saturday. Kansas City police announced a $10,000 reward for information leading to the suspect and released a brief video of the suspect inside the restaurant moments before the shooting. 'Looking for this suspect in the robbery & murder of 25-y.o. Sharath Kopuu at 5412 Prospect last night. Sharath was from India and is a student at UMKC. $10,000 reward for info leading to charges in this (& every KCMO murder),' police tweeted along with the brief video of the suspect. External Affairs Minister Sushma Swaraj on Sunday condoled the death of Koppu and assured all required assistance to his family. 'Kansas incident - My heartfelt condolences to the bereaved family. We will follow this up with the Police and provide all assistance to the family,' Swaraj tweeted. 'I have spoken to Sharath's father Ram Mohan Reddy in Hyderabad to convey our heartfelt condolences. We have offered that in case a family member wishes to go to Kansas, we will facilitate the US Visa. Else we will bring the mortal remains at the earliest,' she said in another tweet. Koppu's cousin created a GoFundMe account in the victim's name to pay for his body to be returned to India. The account raised $25,000 in three hours, The Kansas City Star reported. 'He had the same dreams like everyone else, to make it BIG in the land of opportunity. He had a great sense of humour and always made people laugh and was always eager to lend a helping hand,' wrote the cousin, Raghu Chowdavaram, in the description of the GoFundMe account. People at a nearby motel said they heard five gunshots from the direction of the restaurant, the paper said. On Saturday afternoon, the restaurant remained closed during normal business hours. A sticker on the front door announced surveillance cameras are in place, presumably as a means to deter crime, the paper said. A worker at the restaurant described to the paper what he saw on extended surveillance footage that has not been made public. The suspect, wearing a brown shirt with white stripes, demanded money and pulled out a gun. "He's scared he's going to die," the man said of Koppu. As people ducked or ran for cover around him, Koppu bolted directly away from the suspect, toward the back of the store. "(Koppu) ran, so he shot him" in the back, the paper quoted the worker as saying. Three or four customers were in the store at the time of the attempted robbery, the man said, as well as several employees behind the counter. The university has reached out to Koppu's family in India, and counseling services are available to the university community, according to a statement released on Saturday. 'We offer our sincere sympathies to Sharath's family and friends in the wake of this senseless tragedy,' the statement said. UMKC Chancellor C Mauli Agrawal offered his own condolences in a tweet on Saturday evening. 'Sharath and I share an Indian heritage, but all of us at UMKC share in the grief such tragedies bring,' Agrawal wrote. The Telangana government on Sunday assured the family of Koppu that it would take all steps to bring back his body at the earliest. Telangana Deputy Chief Minister K Srihari, IT Minister K T Rama Rao, former Union Minister and Secunderabad MP Bandaru Dattatraya were among those who met Koppu's family, which resides in Ameerpet area in Hyderabad and offered their condolences to the bereaved family. They consoled Sharaths parents -- father Ram Mohan and mother Malathi, family members and other relatives and assured them of all help in bringing back his body for the last rites. Rama Rao said as per information from the embassy officials, it is a murder and the accused and the motive are still not known and details were being collected. In view of it being the weekend in America, they said it may take 4-5 days to bring back the body to Hyderabad. Rama Rao said they told the family that the government would make all necessary arrangements to provide emergency visas and bear the entire expenses for the family members or relatives who wished to visit the US. Srihari said, "We are trying to get in touch with Telugu students there. There is no clarity still as to who fired on him and why he was shot dead." "All details about the incident are being verified," he said, adding that as per the directions of Telangana Chief Minister K Chandrasekhar Rao, the government would extend all support to the family. The government would make all efforts to bring back the body at the earliest to Hyderabad, the deputy chief minister said, adding that if anyone from the family, relatives or friends wished to visit the US, the state government will also make all necessary arrangements. Dattatrya said he would soon speak to Swaraj and the embassy officials and make efforts to ensure that the body can be brought to Hyderabad as soon as possible. The family had met Telangana DGP M Mahendar Reddy yesterday to seek information on the incident. "They responded. Last night, the DGP called me up and informed about the demise (of my son). The Regional Passport Officer also assured of getting immediate passport and making other arrangements. My son-in-law is there and he is looking after to bring back the body," an inconsolable Ram Mohan said.